We are almost at the two year mark! 730 whole days and nights in Qatar. And, in the two years I've just about spent here, a significant part of that time has been taken up driving in my vehicle. Driving almost every single day. First it was learning to drive here. Mastering the roundabouts and the other drivers. Then it was finding my way. Getting lost over and over again. Eventually finding routes I liked and familiar landmarks. Navigating parking lots and desert detours. Next, it was working on my patience while being honked at, passed, flashed with high beams, and cut off regularly. Recognizing good drivers from bad a mile away (literally), and carrying on with my errand(s) safely and calmly. I am guessing I spend an hour a day in my car. Sometimes more. Minus some vacation days and whatnot and we're still talking hundreds of clocked hours behind the wheel. Plenty of time to notice the numbers. 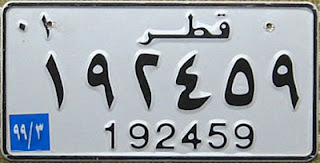 The digits on the State of Qatar license plates carry with them status that the plain old plates back home could only dream of. These babies earn a few ooohs and ahhhs as they adorn the backs of their rides. They are nothing special to look at - just rectangular metal plates painted black and white (the new ones have the inverted State flag too), with numbers recorded in both English and Arabic. When we first arrived in our new home, C's company had arranged for a greeting service to come collect E and I and show us around a bit. The lady who ferried us to and fro for a few days was the first one to point out licence plates here and explain a bit about them. She had said that the numbers, much like in other countries, were randomly generated and assigned, but the smaller the number, the more valuable the plate, and thus highly sought after. For example, if your vehicle is sporting a 245 as its plate number, it would be worth loads of cash compared to a lowly 365498 (close to my own plate), which would be worth a big fat 0. I have heard a few different stories about the meaning behind certain plate numbers. My (now former) neighbour had insisted that the small numbers were reserved for those who were direct relatives of the Emir. I pondered this for a while, because you never see a Ford Pinto bombing around with a 36 on it's tail. 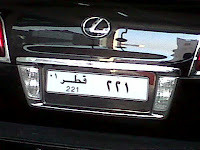 Rather, it is the super luxury vehicles that sport the smallest numerals. And who can buy the best of the best in automobiles? The very rich and the odd lottery winner... but since gambling is prohibited here, we're left with just the wealthy ones. Eventually, I mustered up the courage to ask a few Qatari acquaintances (thank you to Mohamed, Abdulla and Ahmed) about the license numbers so I could gather some cold hard facts. Was that really a royal Sheikha in Jimmy Choos, driving '4477', that just helped herself to my parking spot in this mall lot? Couldn't be. Could it? How one arrives at the exact value of a certain plate isn't perfectly clear to me, but it all boils down to good ol' supply and demand, and a whole lot of extra dough. 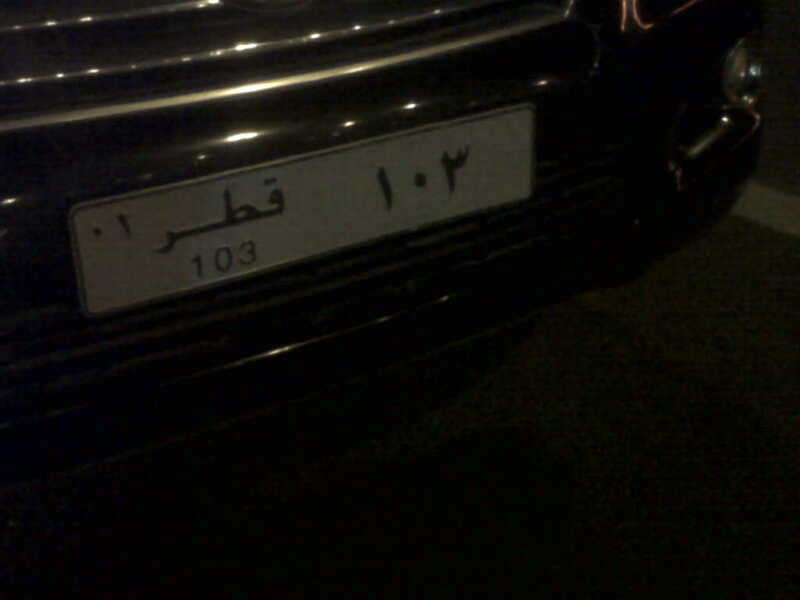 Basically, the plate numbers are randomly generated and assigned by the appropriate government ministry. At some point along the way, people started wanting smaller numbers (those closer to the digit '1'), and so they began to offer to pay for them. Plates here are legally registered to an owner seperate from the vehicle, and can be sold and registered to a new owner (and that new owners vehicle) pretty easily. Plate number value depends on a few things. First, the smaller the number, the higher the price. But if the number sequence is a cool one, or better yet, one with some significance, the price shoots up. C recently saw a '974' plate while in traffic. 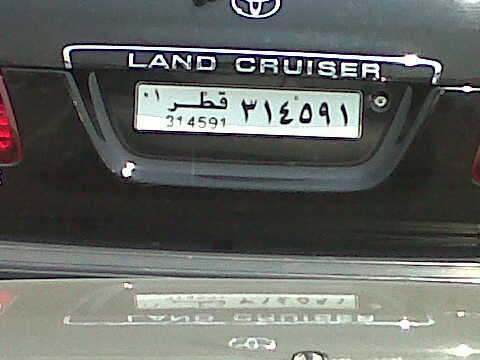 This happens to be the country code for Qatar. Cool factor is way high here. Price would be way high too. If the number is repetitive or in a neat sequence, it renders a fair price... like 262626. Even though it's 6 digits long, it's different... and errr...nice to look at? Numbers like 777 or 4321 would also drive the price up. Waay up. Three digit plate numbers can start around 300,000QAR and go up to 1,000,000QAR (82,00USD - 275,000USD), depending on how 'special' they are. So, 333 would be much more than 825. 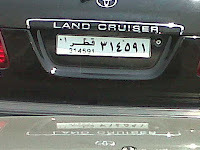 "Well if I have a Land Cruiser worth 250000QAR, and I purchase a three or four digit plate at, 1,500,000QAR, then my car is now worth a total of 1,750,000QAR (almost 500,000USD). The whole package is impressive now. It's kind of like investing your money. 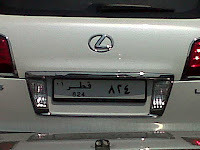 The value of the vehicle may go down with time, but the plate will only get more valuable." Hmm? I then argued that maybe folks in these parts may lose interest in spending loads of loot on a small piece of hammered tin. Then what? He replied that families here that can afford these types of plates do look at it like a sort of investment. They can keep those numbers in the family and pass them on. The value grows. I brazenly questioned the 'show off' factor to all this. I mean, come on. I can think of a hundred ways to spend wads of cash. Buying a funky license plate number so the guy stuck behind me on his way to work can see it, isn't one of them. Each time I mentioned this component to my local informants, I was met with smiles. Of course. It's always nice to be noticed. Things are different here. Status and prestige are big things. Really big things for some. A local man last year reportedly spent almost $4,000,000 USD on a coveted plate number. Four. Million. Dollars. The plate he purchased was "55555". Five 5's. Wowsers. 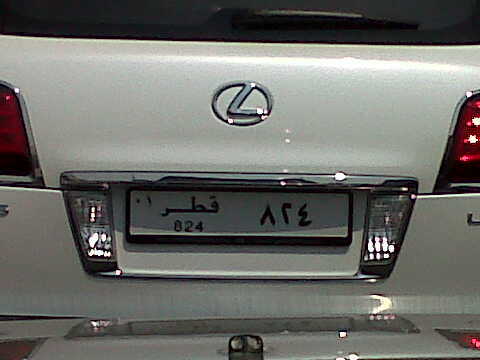 Just like my little obsession with Ghutra styles, I now watch for 'good' plate numbers where ever we go. We have spotted some impressive ones. It's a solid distraction when the tension of Thursday night traffic starts creeping in to our car. What do you think? If you had money to burn, would this be how you would burn it? NM - I guess it can! Thanks for stopping by! Awesome love hearing about all these random customs! wow! Next week will be my 3rd (or 4th, i forget) trip to Doha for work. I can't wait to notice the plates - thanks! Yes, it is a great way pass the time! Haha! Have a safe flight! Where are you flying from? I was waiting for this one...well said! I enjoyed the hunt for the perfect plate. When I was visiting and you were driving, I had my eyes peeled to the rear end of any vehicle that crossed our path. It was loads of fun. Thanks! At least it’s a little more subtle in its vanity compared to here in the West. 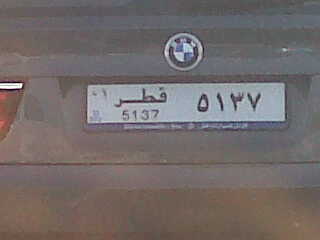 I wonder how plates like this would go over in Doha? ; N V THS 1, TOPTHIS1, EXPENSIV, PRIDE, HIGHIQ. The HIGHIQ one was spotted on a 94 Camry. Thanks for another great story Natasha. And yes, it makes for a good way to pass the time on road trips! 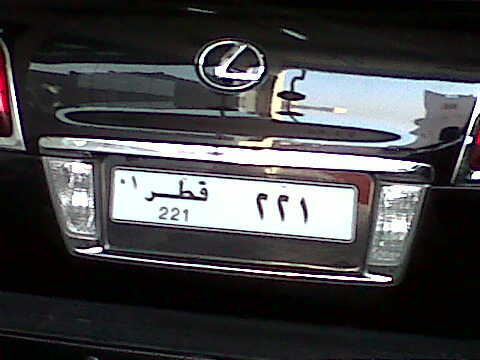 Hi, I was wondering if you could get one of those new Qatari plates with the serrated flag on its left? I'd like to buy one - please let me know... I'm in the States.